Forty Pittsburgh homes will be cozier this winter thanks to a partnership between Frost King and the student-run Freedom by Design chapter at Carnegie Mellon University’s School of Architecture. Each kit includes Frost King door sweeps, weather stripping, window kits, and socket sealers, as well as a screw driver, tape measure, and a guide to making your home more energy efficient. The initial plan was to distribute 20 kits in Pittsburgh’s East Liberty, Larimer, and Homewood neighborhoods – but Frost King’s product donation helped Freedom by Design double the number of kits that will be distributed. Kits will be handed out on November 3. 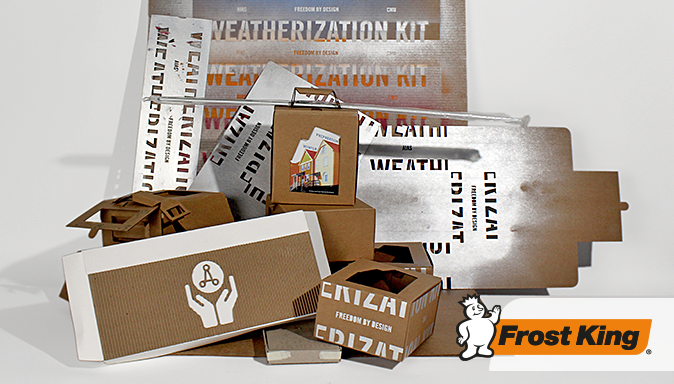 CMU's School of Architecture chapter of FBD developed this project to address the cost of heat for low income families by distributing weatherization kits and informational materials to help reduce utility bills. We will be putting together weatherizing kits for people in need specifically from the East Liberty, Larimer, and Homewood communities in Pittsburgh. In Pittsburgh, 66% of working families make the choice between paying for rent or paying for utilities. In many cases, the house being rented is poorly maintained and people are unable to afford to make the repairs. As a result, the heat paid for will largely go out the window. Through distribution of the Kits and Booklets, simple and accessible initiatives are shared with low income families. These easy changes can dramatically reduce a household’s utility bills, thus reducing the need to make tough choices about which bills to pay. We are hosting kit distribution events specifically for people in need living in the East Liberty, Larimer and Homewood communities. These kits are both addressing a need for information on how to perform these energy and cost-saving initiatives, as well as providing the materials necessary to do so.